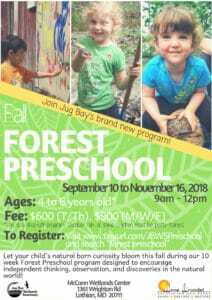 Let your child’s natural born curiosity bloom this fall during our 10 week Forest Preschool program! Rain or shine, we’ll spend every morning (M/W/F or T/TH) outdoors engaged in hands-on, nature-themed play and activities designed to encourage independent thinking, observation, and discoveries in the natural world. Ages: 4-6, children must be potty-trained. This is a drop-off program lasting 10 weeks beginning September 10th and ending November 16th. Fee for full 10 weeks of the program: $600 (T, TH), $900 (M/W/F), or $1500 for five days/week. For full five days, sign up for both the two day and three day option.